You may have noticed I have added a few new links recently that have botanical content. Kingsdowner presents an excellent commentary of all types of wildlife and habitat in Kent and has some great photography too. A constant reminder of the reasons to keep on going back to Kent. Of particular interest to me are the two Greek ones covering orchids and other botanical interest. They are reminders that spring starts early in the Mediterranean and that I would rather be out there walking in the sun than here writing blogs! They also illustrate the spectacular richness of the Greek flora, for example, Crete, an island only about 160 miles long and forty miles wide has more native plant species than the British Isles and the region around Mt Olympus in the north of the mainland has even more. If only all those summer tourists knew what they were missing! 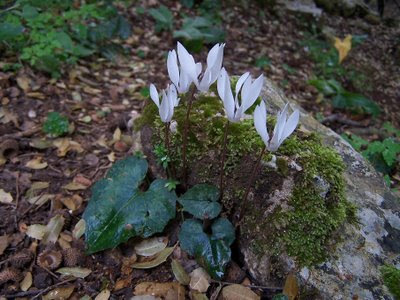 Photograph of Cyclamen cretica for no other reason than I like it! They also set me thinking that since I found them by a very roundabout way and I do not read or speak a word of Greek (although I know all the letters!!) there may be other foreign language (especially European) botanical blogs out there. If I find any I will probably have to treat them likes comics, look at the pictures and not read the words but if they are anything like the two Greek examples already found they will be well worth it. Last but certainly not least, I have just added a new blog, Plants of Skye, Raasay and the Small Isles, admittedly it covers an area a long way from south-east England and so I am unlikely to get there very often but it is the genuine article, a botany blog written by a botanist. Thanks for the kind comment. Hopefully I will post a bit more often in the future!!! Thanks for the kind comments, but I think I learn far more from your blog than vice versa.